Product prices and availability are accurate as of 2019-04-21 19:46:30 UTC and are subject to change. Any price and availability information displayed on http://www.amazon.com/ at the time of purchase will apply to the purchase of this product. 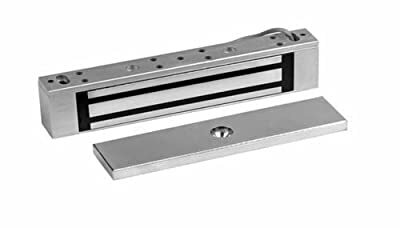 Rutherford Controls uniquely small electromagnetic lock is ideal for small enclosures. The compact size offers secure locking for cash drawers, machinery access covers, vending machines, filing cabinets and many other applications. The 8375's 300 pounds of holding force makes this electromagnetic lock incredibly strong for its size. Applications : cash drawers, drug cabinets, filing cabinets, safes, vending machines and access cover hatches. Brushed Anodized Aluminum finish. Low-profile design, Low energy consumption loks. Field selectable voltage - 12/24VDC. MOV surge protection locks. Hardened steel armature nut fitted. Power/current requirements: max 0.36A at 12 VDC max 0.18A at 24 VDC. Wiring requirements: 2 wires - power input. Holding force: up to 300 pounds. Lifetime warranty. Measures 6-17/32 inches length by 1-1/2 -inches width by 13/16 inches depth.